This is a great product to keep lines and aging at bay. It is endorsed by a lot of dermatologists including my own. I would have given it a ten except that the price is high. I have been using this for 5 yrs, but I switch it up with others. It is fantastic for dry skin or eczema. Worth the price and extra protection against the sun. You can by them by the sample trials on amazon and ebay & I tested it out, all 6 small travel sizes amount to the regular bottle size that sells for $146 where as the travel sizes of 6 bottles cost about 35-42 bucks. Be careful though somet...read moreimes they turn orange, it should be clear because that means it's more new and hasn't oxidized yet. It still works when it's orange, but clear is better. They say to buy it from spa's to be safe, but I bought a sample travel kit from my spa, and the CE Ferulic was already orange, so basically you want to hold it up to the light and you can tell if it's clear or has turned orange. You can always ask the seller what is the manufacturing date on it to be safe. 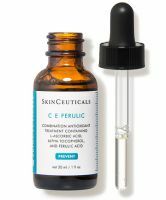 If you buy it from skincueticals site, you'll of course get the best product and can always send it back if it's not clear, but it is very pricey, but the CE ferulic is worth every penny! Even though this product is $163 , only a few drops are needed for each application. It helps erase redness, and makes your skin glow. However, for the price you pay, it should not oxidize after a few uses. And, it does oxidize very rapidly. I believe this could be solved with different packaging. It is in a dark glass bottle, but it should be sealed with a pump so that the serum is not expose...read mored to air every time you use it. That exposure is what causes it to oxidize so rapidly. But, with that said, it does everything that it promises. My oily skin reacts well to it. It helps my sunscreen to work so much better. It helps to fade acne scars and softens marks.